Besides three warmup wines, the jury tasted blind a total of 43 2015 Riesling Kabinetts. Martin had opened the bottles the night before and had a second sample of each wine, just in case. The table included tasting sheets, spittoons, and a couple of Zalto Universal glasses for each guest. Martin sat at the head of the table and passed around two chilled bottles of wine per flight. After 10 Kabinetts, the scores for each bottle were noted using the 100-point system. The labels were revealed only after we tasted all the wines. Rankings were taken from the unweighted average of all scores for each wine. The highest and lowest were excluded. Because of this scoring method, it is important to note that the group results may not be reflective of individual tasters' preferences. Felix Eschenauer of Medienagenten, who was given the details of each Kabinett (ripeness, residual sugar, and acidity), arranged the flights. Before we began the tasting, we sampled two dry Rieslings. One was 2014 Riesling Unplugged from Tesch, the other 2014 Kallstadter Saumagen Kabinett trocken from Koehler-Ruprecht. We used these two wines to discuss scoring points, as I don't like to rate wines on a 100-point scale and I wanted to get a better feel for how the group scored them. These couldn't be more different and were also served blind. Sadly, a point rating tells us nothing about the difference in style. We followed these two wines with a 2015 Niedermenniger Herrenberg Kabinett feinherb from Hofgut Falkenstein, whose wines I represent and where I work as an apprentice winegrower. David requested to have a couple of dry-tasting Falkenstein Kabinett wines before the real event. This green-tinted, light-bodied Saar Riesling tasted more dry than off-dry, with about 13 grams of sugar per liter. It naturally stopped fermenting on its own in a 1,000-liter old Fuder before reaching the arbitrary cutoff of what is "dry," or trocken. As I wrote in my piece in issue no. 96 of The Art of Eating ("Mosel Wine: Light, Zappy, and Dry"), the VDP "ignores the all-important wines between 9 and 18 grams." Most of the tasters seemed to like the wine. But Paula preferred the nose to the palate. David seemed to like it more than she did. I like this Kabinett and wish more winemakers would make delicate, unchaptalized Rieslings in the halbtrocken range. My favorite, however, is the 2015 Niedermenniger Herrenberg Kabinett trocken, which wasn't at the tasting. This is a light, pure, salty, lean, and bone-dry Saar Riesling. But it's never going to be everyone's cup of tea. And that's fine with me. The group was now geared up for the residually sweet Kabinetts, a category that is often described as the "traditional off-dry style" of Mosel Riesling. We had a lot of flights ahead of us. For me, it was too many wines for one sitting, and although I'm not much of a note-taker, I felt pretty good about my impressions of each wine, even if it was hard to describe and rank them (especially a wine from an early flight with one at the end). Paula and David wrote extensive notes on each Kabinett and didn't seem too thrilled about the rankings. A couple of David's top wines were different from mine. It goes to show that tastes differ, even among friends. He liked the 2015 Kabinetts from Karthäuserhof and Ansgar Clüsserath. The latter, he pointed out, usually being more reduced early on. The winner of the tasting was the 2015 Wehlener Sonnenuhr Kabinett from Max Ferd. Richter. This happened to be Martin's top contender to win the Cup and one of his favorite wines in recent months, so it was only fitting that it unfolded this way. Martin, who was grinning during the flight, later confirmed that Max Ferd. Richter produced from 1.5 hectares in Wehlener Sonnenuhr almost 10,000 bottles of this wine, or the equivalent of 8 Fuder. Congratulations to Constantin Richter! I've yet to taste his other 2015s. For those curious about the numbers of the 2015 Wehlener Sonnenuhr Kabinett: 82 degrees Oechsle, 45.9 grams of residual sugar per liter, 9.9 g/l acidity, and 7.5 percent alcohol. The second-place wine was von Hövel's 2015 Saar Riesling Kabinett. Max von Kunow wrote that his Estate Riesling Kabinett, which placed higher than his 2015 Scharzhofberger Kabinett, comes from "long-forgotten grand cru sites of the Saar." He signed a long-term lease for the following vineyards in Tälchen ("little valley"): Oberemenniger Euchariusberg, Krettnacher Katzenbuckel, Krettnacher Altenberg (including Silberberg), Oberemmeler Karlsberg, and Niedermenniger Sonnenberg. The average yield was 55 hl/ha and the average ripeness was 86 degrees Oechsle. After fermentation, the wine was racked from the lees and blended in a 20,000-liter tank. He has 26,000 bottles of this wine. I couldn't believe it really placed second, though. The first- and second-place wines were served in the same flight. Admittedly, I thought it was one of the best rounds, as both wines were quite open and accessible. The Richter had a noticeable sponti stink, and I really liked the nose on the Saar Riesling. David Schildknecht was less impressed by the top two wines. He found the 2015 Saar Riesling Kabinett slightly flawed. On the other hand, he was fond of Max's 2014 collection, whereas other critics had a different opinion. I never tasted these. The third-place wine was the 2015 Wehlener Sonnenuhr Kabinett from Schloss Lieser, which had real Kabinett character, fine acidity, and crispness. In the second flight, I liked the 2015 Monzinger Kabinett from Emrich-Schönleber and the 2015 Mussbach Kabinett from Müller-Catoir, both of which had lower amounts of residual sugar. The Mussbach was more herbal. These are two producers who make very good dry Rieslings, too. Not long ago, in Bad Kreuznach, I enjoyed a bottle of the 2015 Mineral Riesling trocken from Emrich-Schönleber. The two Dr. Hermann 2015 Kabinett wines—Erdener Treppchen and Ürziger Würzgarten—were in the same flight. The Ürziger Würzgarten had a sponti nose and reminded me a little of Günther Steinmetz's Brauneberger Juffer Kabinett feinherb, a note that I made to myself before the wines were unveiled. The one extra-tall, heavy bottle was from Schäfer-Fröhlich. It was the 2015 Felseneck Kabinett, a fine wine, but a little sweet. I was more impressed than some of the others by the 2015 Goldtröpfchen Kabinett from Julian Haart. It had a pleasant aroma, including herbal notes, and tasted very good. One of best wines was the 2015 Wolfer Goldgrube Kabinett from Vollenweider, which was fresh, sponti, and brisk. I also liked both the 2015 Graacher Himmelreich Kabinett from Willi Schaefer (fine acidity, sprightly) and the 2015 Enkircher Ellergrub Kabinett from Weiser-Künstler (floral). These are two wines that really need time to open up and show their full potential. The same can be said of the 2015 Scharzhofberger Kabinett from Egon Müller. A number of wines at the KabiCup 2015 tasted rather ripe and sweet or lacked a little character. The St. Urbans-Hof from Nik Weis, in Leiwen, seemed off. Martin opened a second bottle of the 2015 Bockstein Kabinett, but it didn't taste any better. Paula wonders if the wine might have suffered from having been shipped right before the tasting. In the list above, I included the village name for most of the wines. The VDP is trying to mimic Burgundy with its own classification model, including the VDP.Grosse Lage without the village name on the front label, and thus no Ockfener Bockstein (from the Bockstein vineyard of Ockfen). It's just Bockstein now, as on the St. Urbans-Hof black label for its sweet wines, namely those that have a Prädikat. (Weis writes "Ockfen" in small print below the site name.) This is problematic because there are many other sites with the same name, such as Kupp, Herrenberg, or Schlossberg. Bockstein is considered, along with the Scharzhofberg, to be one of the very best sites and was historically listed at one time as just “Bockstein” or “Bocksteiner,” but many vineyards—like Ayler Kupp, Eitelsbacher Karthäuserhofberg, Dhroner Hofberg, Graacher Himmelreich, Bernkasteler Doctor, Zeltinger Schlossberg, or Trarbacher Schlossberg—included the village or town name in the 1890s, with an adjectival -er ending, indicating the possessive case, much like the vintage 2015er (from 2015). Unfortunately, the 2015 Krettnacher Euchariusberg Kabinett (AP 8) from Hofgut Falkenstein had cork. Martin noticed this the night before, so the wine wasn't in the tasting. The grapes for this Kabinett come from a small parcel with old, ungrafted vines in the prime section of the original Euchariusberg, which, in the late 19th century, was considered a top site and had, like Bockstein and Scharzhofberg, no village name attached to it. This is a different Fuder from the one in sixth place, which comes from a neighboring plot with old, grafted vines. Martin declared Falkenstein's Kabinett (AP 12) his "discovery" of the KabiCup. In the past, Erich Weber at Hofgut Falkenstein only made single-vineyard Kabinett trocken wines. Klaus Peter Keller, a friend of Martin's and a fan of residually sweet Mosel Kabinett, forgot to send samples of his own Kabinetts for the tasting. In past vintages, these were designated "P" (Pettenthal) and "H" (Hipping). Both sites are located by Nierstein on the famous Roter Hang (red slope) of the so-called Rheinfront. (In the future, Keller and other VDP.Rheinhessen members should be able to list the single-vineyard names for Kabinett wines once again. He made two Kabinetts from Hipping in the 2015 vintage.) It would have been great to taste these along some of the best wines from the Mosel, including his favorites, like Egon Müller, Willi Schaefer, and Maximin Grünhaus. As with many connoisseurs, Klaus Peter prefers his Mosel Kabinetts with at least 10 years of bottle age. Some other notable producers missing from the tasting included Joh. Jos. Prüm (another Keller favorite), Selbach-Oster, Fritz Haag, and Dönnhoff. J.J. Prüm releases its wines in August. Martin said that Dönnhoff's 2015 Oberhäuser Leistenberg, a side-valley site with weathered clayey slate (Tonschiefer in German), didn't arrive on time. This is too bad. I find the wines from Dönnhoff have a kinship with Mosel. One of my favorites not at the tasting is Weiser-Künstler's 2015 Wolfer Sonnenlay Kabinett, a new wine from Konstantin Weiser and Alexandra Künstler. It also comes, like Dönnhoff's, from a cooler side valley. It should be noted, too, that many of the top producers (Maximin Grünhaus, Schloss Lieser) make more than one Kabinett. But Martin had to pick and choose. Martin selected the wines and organized the tasting, as mentioned above. He, however, refrained from judging them. Charlie Gierling says: "The wines showed admittedly the slim style, which one so loves about Kabinett, but I wished they had more liveliness and tension. The wines made a serious impression. Nevertheless: buy!" He felt, as others did, that certain wines tasted too sweet and more like Auslesen. 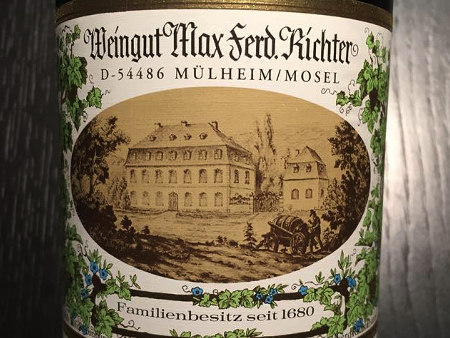 In his tasting notes, he rated the 2015 Saarburger Rausch Kabinett from Zilliken and the 2015 Maxmin Grünhäuser Abtsberg Kabinett 90 and 91 points, respectively. But he noted that they were Auslese in style. Of course, many of the "fruity-sweet" Kabinetts in this tasting had more than 88 degrees Oechsle and 50 grams of unfermented sugar. In general, the 2015s have both ripeness and briskness. Some of the wines were recently bottled and closed down. Both David and Paula said it would have been better to do the tasting in a couple of months. The top-rated wines were those that were showing well now. But David felt some of these had little more than a sweet-and-sour flavor profile. I think we would have benefitted as a group and learned a lot more from each other by having fewer wines and discussing them after each flight. All of the wines deserve to be tasted. For the record, I rated no wines over 90 points. But that doesn't mean much. I just chose to be conservative, though my ratings were similar to the others who have more experience with point-scoring. I'm a fan of Kabinett, including those still labeled trocken and feinherb. Martin says that the results of his KabiCup won't influence his buying decisions. I like his confidence and laid-back attitude. As some readers know, I've been critical of such tasting competitions, including Martin's original BerlinRieslingCup—a tasting of high-end dry German Rieslings, mostly Grosse Gewächse (GG) from VDP members. I also mentioned this in my report on the BerlinKabinettCup 2013. And yet, despite this, he still asked me to arrange the flights for the BerlinKabinettCup 2014, where I grouped two of my favorite wines in the same flight, namely Weiser-Künstler's 2014 Enkircher Ellergrub Kabinett with Willi Schaefer's 2014 Graacher Himmelreich Kabinett. It took me a week to write about the KabiCup, as I came home exhausted each day from working in the vineyards and preferred to relax and watch the Euro 2016. We've been busy pulling weeds and tying up vines and we still have to remove shoots on the trunks in various parcels. On a recent visit to Hofgut Falkenstein, Scott Frank of Bow & Arrow Wines told me that it's called suckering. But the vines are growing so quickly, we have to tuck them in first. In the spring, some Mosel vineyards had problems at budbreak with cutworm and a caterpillar known as willow beauty (Rhombenspanner). There has also been spring frost and even hail in certain parts. Now, with all the rain and humidity over the last several weeks, there are grave concerns about peronospora (downy mildew), which not only attacks the leaves but also the fruit set. Photograph courtesy of Martin Zwick. As I’ve mentioned before, I don’t like giving point scores for wines, especially at one-time tasting events, as wines evolve and need to be retasted. I also would have given conservative scores for top dry or nobly sweet Rieslings. Just because I rated no wines above 90, it doesn’t mean that a Kabinett can’t be great. These are wines that I love to drink. Besides, the range of my scores were in line with the rest of the jurors and clustered between 84 and 89 points. I recently tasted Weiser-Künstler’s 2015 Enkircher Ellergrub Kabinett and I still feel that this is one of the best Kabinetts from the vintage. I also like Willi Schaefer’s 2015 Graacher Himmelreich Kabinett. Both of these are raised in Fuder, too. My favorite place to eat in Trier is Yong Yong, where I help do the wine list. They have residually sweet Kabinetts from J.J. Prüm, Maximin Grünhaus, Schloss Lieser, Willi Schaefer, Weiser-Künstler, and more. The wines are popular here. Most of the light, easy-to-drink dry wines are bottled under screw caps, as more and more restaurants and clients in Germany prefer this closure. It also helps the producer to avoid cork taint and is cheaper than natural cork. A large number of these wines are also meant to be consumed fairly young. Unfortunately, it gives some people the impression that wines under screw cap are of lesser quality. I prefer natural corks, but cork taint remains a problem. Thanks for for the great article! It seems odd for me to ask about a wine that finished near the bottom of the list, but what’s the deal with the Rutz Rebell Kabinett from von Hovel? Is this a special bottling for a restaurant or a distributor? You’re welcome, Andrew. Yes, it’s a special bottling for Rutz Restaurant in Berlin. Thanks Lars – that was my guess. Looks from the bottle that it’s from the erstwhile (?) Krettnacher Silberberg. According to the latest VDP ruling, a Kabinett from a VDP.Grosse Lage should have 85 degrees Oechsle, less than 10% alcohol, and at least 20 g/l RS. This includes the VDP Mosel, Nahe, and Rheinhessen. I purchased a number of Falkenstein’s 2015s. I can only hope the cork problem (from barely detectable to undrinkable TCA and other taint) doesn’t exceed one bottle per case, a rate that I find disappointing. I’ve come to see wooden corks as having outlived their usefulness. We hope so. Amorim Cork is the largest natual cork producer. In the 2015 vintage, we decided to give them a try and bought their top-grade Extra corks, which are used by Peter Lauer, Maximin Grünhaus, Willi Schaefer, VOLS, and Weiser-Künstler, among many others. But some of the batches that we received have a higher incidence of cork taint. Next year, we plan to only use special Rich Xiberta (RX) corks that have been tested for TCA, rather than those from Amorim Cork. We have worked with RX for many years without problems. We just thought it made sense to have more than one supplier to spread the risk in case there were cork issues. Stelvin is not a cure-all (see “Why Screw Caps?“). Thanks. I’ll read the article. You’re welcome, Henry. I’m glad you purchased some Falkenstein. The 2016s might even be better.